If the event is part of a course unit – the recording will be published alongside the podcasts for that course. If the event is not part of a course, it will be published in the Ad Hoc area of the Video Portal. In either case, the system will send an email to the addresses specified when scheduling the recording (more details are given below). Navigate to the date of the event on the calendar. You can click the ‘show weekends’ button to display weekend dates and events. Click on the event you wish to have recorded and it’s details will be displayed. You can change the title of the recording; the default value is the name of the booking from the timetable. 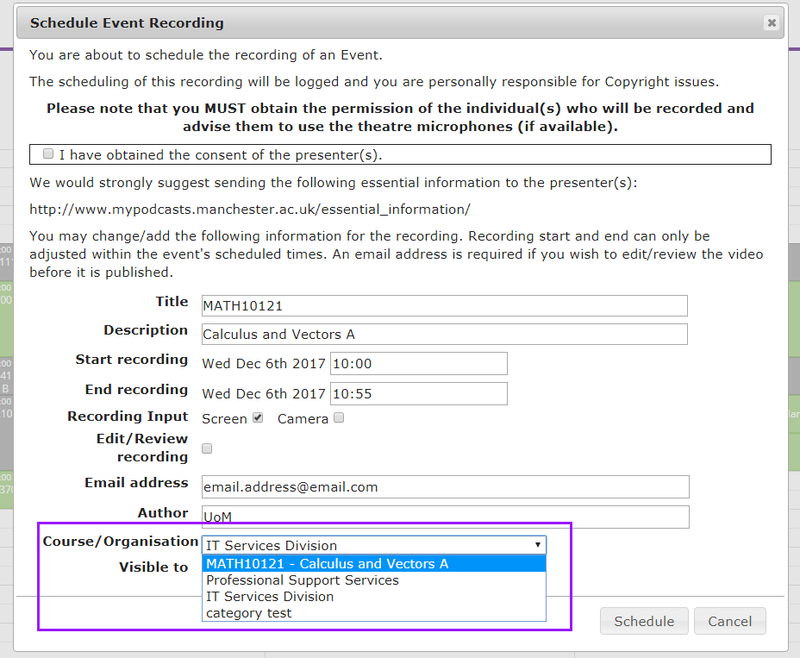 You can also add a description and adjust the start and end times of the recording within the range of the timetabled event. The names entered into the Author field will be displayed beneath the video when it is published. Some locations have a video camera installed which allows video footage of the event to be recorded in addition to, or instead of, the projector screen. Tick either ‘Screen’ or ‘Camera’ if you want only one recorded, or both if you would like the video and projector to be shown side by side in the podcast. If the Recording Input option is not present – this is because the location you have selected does not have a camera installed. If you wish to edit the recording before it is published please tick the “Edit/Review recording” option and input your email address to receive a link to the editor when the recording has been made (note you are able to add more than one email address by adding a comma ‘,’ between each). Only the email addresses supplied in this section will receive the publication/edit email. From the Course/Organisation dropdown box select the area the video should be published to – this can be a Faculty, School or a course if you have access to these, as shown in the image below. The Visible to field can be changed if the video is selected to go into a Faculty or School area. In these cases, the video can be made available to all users of the Video Portal without logging in publicly, to all logged-in staff/students, just staff/students who are part of the selected Faculty/School or you can keep the video private so it is visible only to yourself (please note that system administrators will still be able to see the video). If the recording is made as part of a course – you cannot change it’s visibility settings, it will only be available to staff/students on that course. The options for visible to are shown in the image below. Once the recording has been made, an email will be sent containing either a link to the editor or the podcast on the Video Portal. 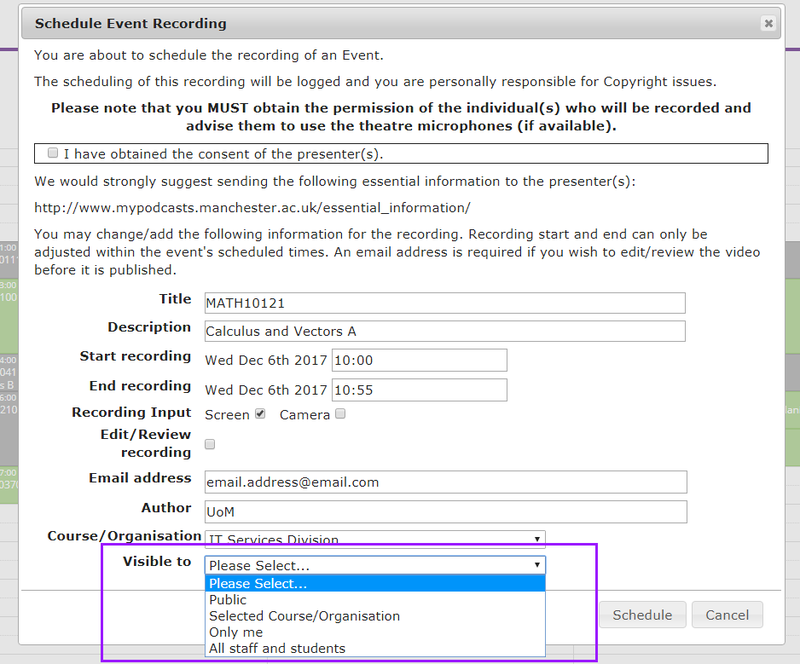 To cancel an event booked to record, you need to access the Podcast Schedule tool and click on the My Recordings tab.Press the Cancel button next to the scheduled event (as highlighted in the image below) in order to remove the booking. The event will then appear crossed out to show it is no longer scheduled to record.